Cannabidiol (CBD), people around Canada and around the world are embracing this plant both medicinally; as well as, recreationally. When used properly, cannabis can make exercise more enjoyable. However, before you smoke a fat blunt and attempt to crush some personal record’s, there are some things to consider. You should note that certain strains of cannabis can increase your heart rate by 20-50 bpm. Strains high in Tetrahydrocannabinol (THC) tend to have a greater effect on your heart rate. Conversely, low doses of THC have been shown to activate the bodies CB2 receptor’s pro-cardiovascular health effects. The lesson here is to stick to low THC, a mixture of CBD to THC; or alternatively, a pure CBD strain, before your workout . Keep in mind that cannabis affects everyone differently. Whether you’re an occasional or regular user will drastically change the impact cannabishas on your body and your senses. If you tend to get a little clumsy when you smoke; perhaps you shouldn’t hold large amounts of weight above your head. Be safe out there. People choose to exercise for a variety of reasons; however, one form of positive reinforcement that undeniably keeps them coming back is known as, runner’s high. A blissful experience, originally thought to be caused by a rush of endorphins; runner’s high is now being linked to Anandamide, an endo-cannabinoid closely resembling THC. Wouldn’t it be great to start your workout with that “I can do anything” feeling? This is where CBD comes into play. CBD inhibits the enzyme responsible for breaking down anandamide, giving this bliss-inducing neurotransmitter a longer lifespan. While you can find certain strains that are high CBD and low THC, I find it easier to use CBD oil for this purpose. Many athletes rely on CBD, to ease anxiety and increase their pain threshold. This allows them to push themselves harder with zero inhibition. Combine the natural, feel-good effect of CBD, with the energetic boost of a low-percentage sativa and you’re in for the most enjoyable workout of your life! I would hope this goes without saying; however, if you have never smoked, vaped or ingested cannabis before, allow yourself some time to see how this plant affects you. For boosting the good vibes mid-workout, check out The Kind Pen V2 Tri-use along with your favourite CBD oil. You won’t be disappointed! After a long workout, you’ll likely be tired, sore, and a little stiff. Luckily for you, recovering from a training session doesn’t have to be as terrifying, as jumping in a tub of ice. Sit back and relax with a high-quality, indica strain and let the healing process begin. Some of the more common strains of indica, typically have a higher concentration of CBD and as we know, CBD is an anti-inflammatory. Another reason I prefer indica strains for the recovery process; is the intense body high it can provide. THC also acts as a muscle relaxant; so unlike your pre-workout, you’ll want to choose a strain with a higher percentage of THC to wind down with. While most people find regular exercise improves their sleep; many, still have a hard time getting to bed, if they’ve exercised later in the day. If you suffer from post-workout insomnia, try some indica and become one with your bed. Furthermore, your post-workout tokes could actually be improving your next training session. THC is stored within fat cells, and as you burn that fat THC is reintroduced into your system. If you’ve ever needed a good reason to be active, there it is. 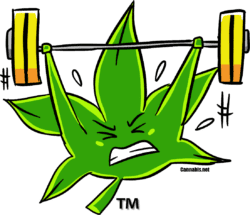 Unfortunately, since there are very few studies on using cannabis while being active and working out; you’ll likely have to experiment to find the perfect mix. Luckily for you, there are a plethora of products available to create the perfect cannabis routine. I highly suggest exploring everything from shatter, wax, oils, distillates, CBD tablets and creams. Moreover, micro-dosing cannabis is becoming a new popular trend, that many people are finding success with. If you’re looking for some new gear to enjoy your favourite bud you can find bongs, dab rigs, vapes, and accessories for sale at Smoky Mountain. Is Micro-dosing the New Future of Cannabis?